"Everything is sculpture. Any material, any idea without hindrance born into space, I consider sculpture." -Isamu Noguchi. Noguchi’s sculptural idiom gains adequately reflect from this sofa, which clearly distinguishes itself from other designs of the same period. The sofa and ottoman seem as if a greatly enlarged sculpture of flat and rounded river stones; yet at the same time, their slender organic forms are graceful and lively. The sofa is suitable not only for use in the living room, but also ideal for commercial applications in lobbies, hotels, boutiques and reception areas. Materials: Fabric of wool covered, Beech wood frame, Maple feet, High density foam. 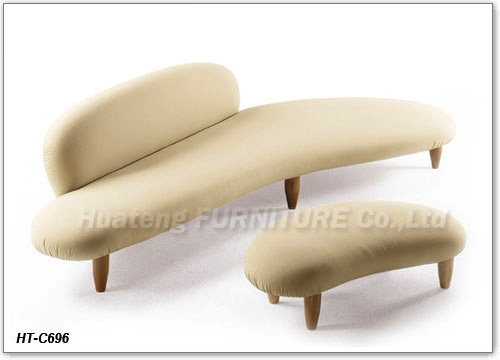 Dimension: sofa : W118"*D51"*H28"(15"seat height); ottoman: W47"*D28"*H13.5"